If they now have pinpoint accuracy, I wonder if we could maybe see quadcopter footage of a landing in the future. What makes you think that they have achieved pinpoint accuracy? Isn't that what the grid fins are about? What makes you think I said they had? OK. I now see that you said "if they now have pinpoint accuracy". I misunderstood your post. There is the possibility that flight 14 will be to a floating "launch" pad and then flight 15 will touchdown on land. With respect to CRS-4 having a low probability of success, is it possible that it could be a repeat of Cassiope, where the rocket spins out of control due to lack of legs? For Cassioppe, it wasn't just the lack of legs that caused the rocket to spin. The thrusters weren't stong enough to counter the spin. I suspect that the CRS-4 flight will have legs but it is likely to disintegrate for the same reasons that the last two stages did (waves slamming the rocket after it lands in the ocean). We keep talking about platforms but, what about a deserted island perhaps. Anything out in the Atlantic and within the flight profile that would meet the criteria? Another wild idea. Could you land it on the deck of an aircraft carrier? Yeah, I know the risks but planes have crashed on decks before. Yep. I can just imagine the reaction of the Capt of a ship when asked if they could land their giant, fire shooting rocket first stage that, may or may not, turn into a giant fireball on the deck of his ship. If "floating platform" is used, I still think it will be a barge. I don't know about landing rockets on a aircraft carrier but, they did launch a V2 from an aircraft carrier. Of course, you can see how that went. Of course, this might have been the test for pinpoint accuracy and I certainly wouldn't park a boat anywhere near the test landing spot. The Navy is NOT going to let one of their aircraft carriers to be the LZ for one of SpaceX's still experimental (in landing) rockets. So lets get that out of the way. More likely, as everyone has pointed to, is an anchored un-manned barge with remote camera's and big huge LZ safety zone buffer. SpaceX might be trying to kill two birds with one stone. It is still not clear if the core of the FH can make it back to the KSC landing pad. The core of the FH might need a floating landing pad at all times. So might as well test the floating landing pad on a F9 flight. The Aircraft Carrier might not be far off. 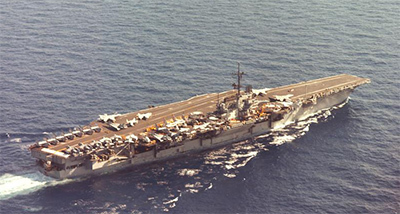 USS Saratoga sold for scrap to Esco Marine in Brownsville Texas. SpaceX might be trying to kill two birds with one stone. It is still not clear if the core of the FH can make it back to the KSC landing pad. The core of the FH might need a floating landing pad at all times. So might as well test the floating landing pad with a F9 flight. They could always land at Britains handy dandy future spaceport. Launching Falcon 9 Heavy from the planned Texas facility: would the core have velocity/range to make it to Florida or any Gulf Coast location? I assume not all launch trajectories are going to be straight east? I'd wondered about the flyback portion--it consumes significant propellant and a floating platform should be robust enough to suffer a bad landing without much damage. The remaining questions are whether a landed stage can be easily secured and economically returned. A RTLS does eliminate the time and trouble of a remote recovery. I'd wondered about the flyback portion--it consumes significant propellant and a floating platform should be robust enough to suffer a bad landing without much damage. If FH flies with cross-feed, it could reach Florida. But remember that they can also choose to launch FH without cross-feed. In that case it would fly like the Delta IV-Heavy, where the core throttles down after liftoff. The DH core could in that case make it back to the launch site. I guess it all depends on how heavy the DH payload will be. With a reasonably consistent alteration of the picture made by that ice, I wonder whether something 'simple' like using the first image from "the landing burn begins" to create a filter to apply to the rest would work. Of course you'd need to have a clean photo or some basic template of what it should have looked like without the ice.... not so easy. In any case videographer or fx work rather than fixing the technical underpinnings as in the last video. Agreed, it all depends on the payload. If it's a real heavy LEO launch with a low angle orbit then FL is an option, however, I would assume that most payloads like that would like to be high angle or polar. That would require a LZ in the Bay of Campeche or the Yucatan. If it's a GEO or inter-planitary then you could just land it back at Brownsville or a platform in the Gulf of Mexico. The remaining questions are whether a landed stage can be easily secured and economically returned. A RTLS does eliminate the time and trouble of a remote recovery. It may be that even when RTLS is the preferred option, an alternative landing site may be ready if something makes the launch site unusable - though the weather at the launch site shouldn't change much in 10 minutes. If they land down range then it's not just the return, they also have to handle the weather at that location, so they'd need to either abort a launch if there was bad weather at the down range landing site, or launch without recovery, or have 3 or 4 options so they can pick the one with good weather. Right? Could be both a barge and a carrier. Where's the Ranger now days?